Our third year of working with Adventures in Preservation brought about our most successful workshop yet! The mix of archaeology, architecture, and architectural conservation resulted in new discoveries, new friends, and a new model for our work preserving the Fairfield manor house. Over five fast days (and a half day behind the scenes tour of Colonial Williamsburg), workshop participants left with feelings of excitement and a new perspective on the past. For a complete photo gallery of the workshop week, check out our Flickr album! 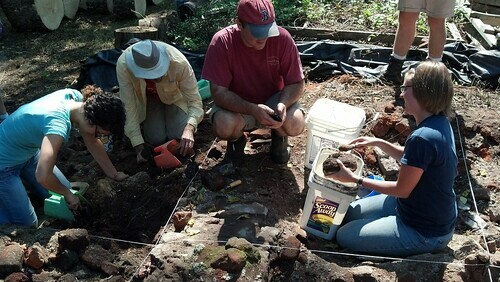 Starting bright and early Monday morning, workshop participants became familiar with Fairfield Plantation through a detailed site tour, after which they dove right into excavations on the 1694 manor house foundations. The crew of Jammers (the term for Adventures in Preservation participants) quickly picked up the methodologies of removing rubble from sections of the collapsed building. 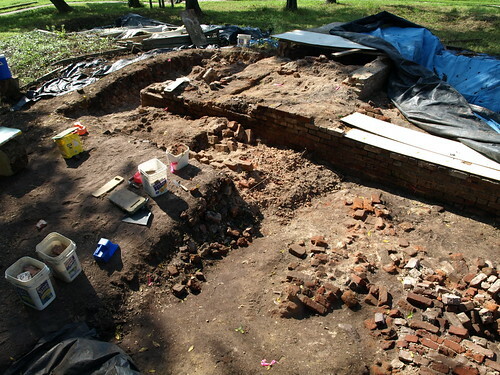 Sorting through piles of architectural materials, distinguishing whole bricks, brick bats, mortar fragments, and the rare artifact, slowly revealed the building’s intact foundation walls. Our goal with the house is to uncover and document the remaining foundation walls so that we can identify what conservation is needed to preserve the building, as well as identify clues to the evolution of the building. 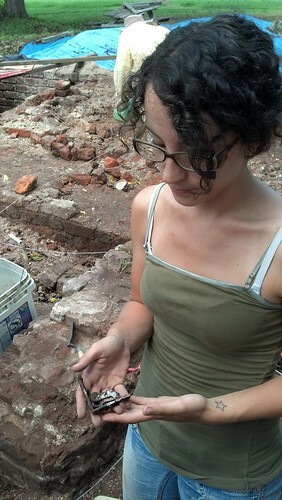 Workshop participants learn to distinguish brick bats from brick fragments amidst the building rubble. The workshop’s second day was an educational lesson for us all, not just the workshop participants! Historic mason Ray Cannetti, along with Jason Whitehead and Bill Neff of the Colonial Williamsburg Foundation, demonstrated how to make authentic period oyster shell mortar, which will work with the soft, hand-made bricks in the foundation rather than against them, in contrast to a material like modern Portland cement. The expert team showed us how to lay bricks using this mortar mixture, in both English and Flemish bond, sharing insider’s tips, tricks, and jokes before letting everyone try their hand at bricklaying, including the touch-up tasks of finishing and ruling mortar joints. Our efforts may not have equaled those of our more experienced teachers, but they looked pretty good! 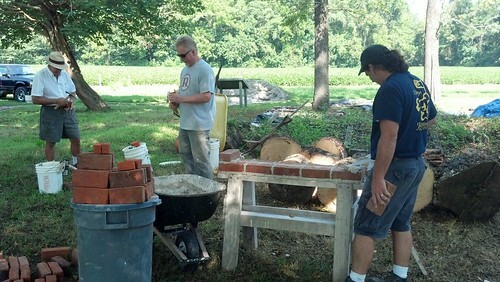 Jason begins laying bricks with the lime mortar, while Ray and Bill break bricks to create closers. 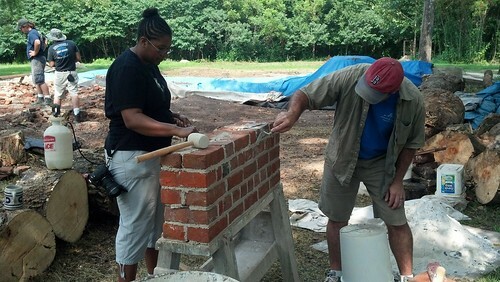 Dave Brown and workshop participant Erica Singleton use finer tools to put the finishing touches on mortar joints. On Wednesday morning, participants got an even bigger treat than playing with bricks and mortar – a once-in-a-lifetime, behind-the-scenes tour of the restoration work on Jamestown’s iconic 17th-century church tower. Participants saw the techniques taught by Ray, Jason and Bill put into action on one of the nation’s most significant historic landmarks. Along with Colonial Williamsburg’s Director of the Grainger Department of Architectural Resources Matt Webster, they were able to “read the ruin,” pointing out brick and mortar details that allowed them to understand and interpret the various evolutions of the church tower, which are guiding their preservation efforts. 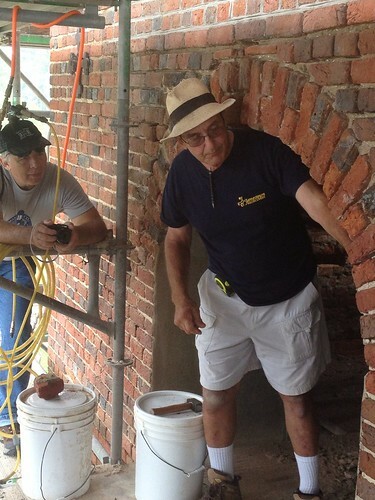 Ray Cannetti stands under the arch of the Jamestown church tower as he explains the stabilization process. 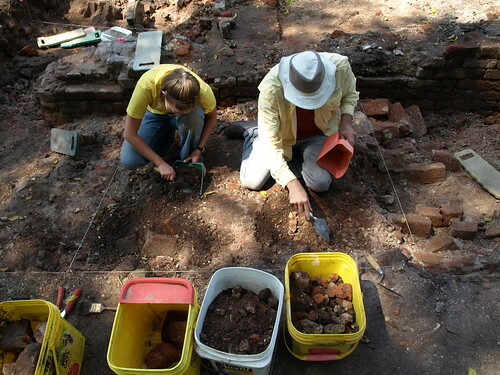 Back at Fairfield on Thursday, the crew enthusiastically resumed archaeology within the rubble, now adept at recognizing specially formed water table and rubbed jack arch bricks. As the day progressed, exciting discoveries kept everyone in high spirits. Working near the cellar, crew members pulled out interesting architectural artifacts, including the corner of an iron box lock, as well as a possible lightning rod mount. 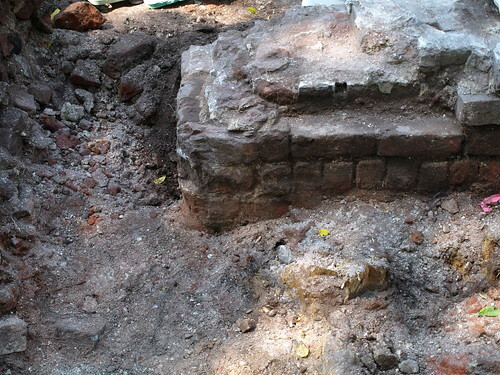 In an interesting twist, excavation within the early 18th-century extension of the south wing, just to the south of the original 1694 foundation, revealed an unexpected opening in the foundation. Analysis of the historic photos of the manor house indicate that there could be a cellar window in this location (the view of which is blocked by an exterior porch in the photo). Alternatively, the opening could represent another type of opening: a stairway into the cellar. Working through this process of discovery as a group – workshop participants, Fairfield staff, and Jason Whitehead of CW – and bouncing ideas off of each other about what this could mean, was exactly the kind of experience we were hoping for! Workshop participant Sarah Medwig displays her find from within the rubble: the corner of an iron box lock. Further excavation revealed interesting brick details surrounding the newly discovered cellar opening, including a course of row-lock bricks (laid on their sides with their short ends exposed). As if the archaeological activities themselves weren’t exciting enough, Jason Whitehead led participants in the stabilization work that Ray Cannetti had begun the previous afternoon. 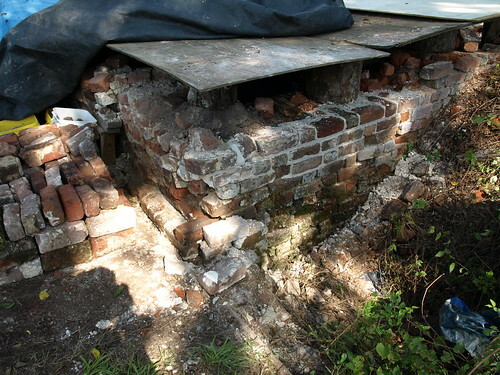 After dismantling unstable sections of the original southwest corner of the manor house foundation (the exterior of the ‘mystery room’), Jason identified whole bricks and brick bats for potential reuse. Using the authentic lime mortar, he worked with workshop participants to build back and repoint sections of this corner. Their progress was instantly visible and inspiring. 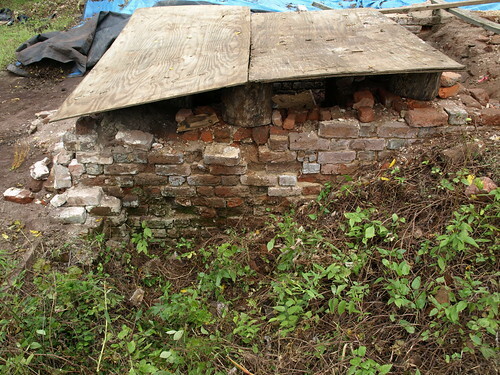 The southwest corner of the 1694 foundation, before stabilization. 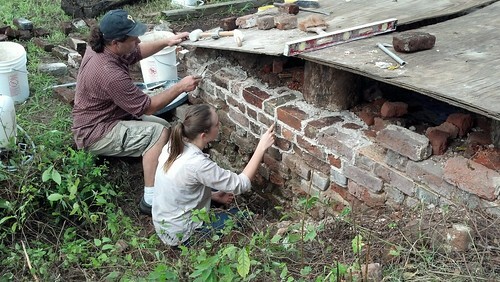 Jason Whitehead instructs Hallie in re-pointing this section of the foundation. The newly repointed southwest foundation corner. Workshop participants Patience De Roo and Steve Smith work seamlessly together in the rubble, after nearly a week of practice! An overall view of the foundation section uncovered by workshop participants throughout the week. On the right is a previously excavated area with exposed fallen wall left in situ. 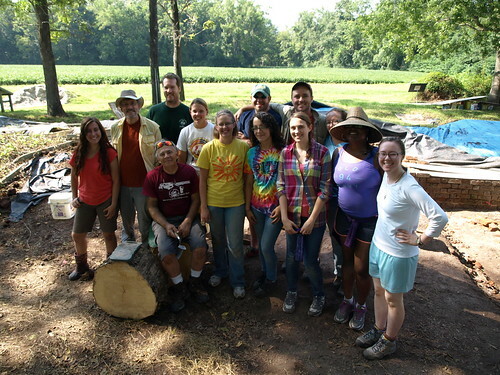 Our happy workshop crew on the last day at the site! Friday, our last day at Fairfield, included more excavation around the house foundations, exposing several sections of fallen wall, and spending much of the afternoon wrapping up the site work with plenty of photo documentation, discussion, and moving brick bats. Across the board, the workshop was a great success, and each of the amazing participants helped us take measurable steps towards our goal: to preserve the manor house, provide a sense of place for visitors, and create a launching point for guests to engage with Fairfield’s storied past. The project succeeded through the collaborative efforts of archaeologists and architectural conservators, and our hope is that this workshop will serve as a model, not only for our own future projects, but for others who dedicate their time towards protecting our shared heritage. If you want to join a similar adventure, we encourage you to visit the Adventures in Preservation website and peruse their selection of upcoming workshops. 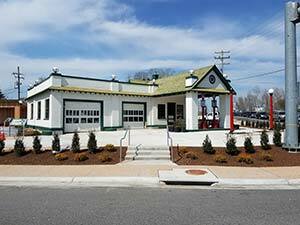 And stay tuned for future workshops at Fairfield where you can help us document and preserve this important historic resource. If you have followed along with our adventures this week, please drop us a note on how we did and what you liked about our work – and again, you can see more images from the week in our Flickr album. We have many opportunities to help with researching and preserving this unique 17th-century ruin, as well as a variety of other preservation activities, so please get involved. My appreciation of your work at Fairfield is beyond words. And my geographical distance from you as I reside in Michigan is a personal frustration -I should be assisting you since many of my Burwell ancestors from Fairfield are buried not too far from you next to Abingdon Anglican Church in White Marsh. My Daughter, Elizabeth Burwell Stuck in Grand Haven, Michigan, will echo my frustration, and appreciation. Thanks to your professional efforts Fairfield may become more of a historical significance that even Carter’s Grove which our ancestors built in later years. what a fantastic compliment. We are forever in awe of the accomplishments, particularly in architecture, of the Burwell family and everyone involved in the construction of these manor houses and plantations. Their stories are an essential element of our shared heritage – complex, interesting, and worthy of continued research for all the new discoveries uncovered every day. We hope our efforts on social media, through this blog, our facebook page, and our other outreach outlets, are getting through to you and that you can share in some of these moments with us. Please stay in touch and don’t hesitate to reach out to us if we can be of any help or send anything along to you.